Just a tad late, but here nonetheless! Bio: Xol was born into the corrupt socialistic regime that had consumed Cethlos at that time. He had always been fascinated with technology, but cultural limitations had stopped him from indulging in this. He stowed away on an intergalactic cargo ship at a young age, and through a series of surprising escapades, he found himself onboard the INRS (Intergalactic Nephid Research Station), a spacestation dedicated to advancing technology. Xol spent several years here, before he finally went rogue and used his new technology as a freelancing mercenary. He found out about Nerrone’s Rangers through Kwa, a long time acquaintance and friend. Delta, are we supposed to talk in 3rd person, or 1st? Well you can talk in first person if you want to, but it makes remembering your character's name a whole lot easier if you post in third-person. In short, your choice. Equipment: Electro sword (I always use that), soldering gun, A few other minor technological stuff. Bio: A very smart engineer, with an okay past, although my experiments became a bit...crazy, so I escaped and became a criminal, although I don't have many bad intentions, I was never quite the same. Delta are we allowed to use NPCs? For short spaces of time, yes, I suppose you can insert NPCs. However, use them sparingly please. 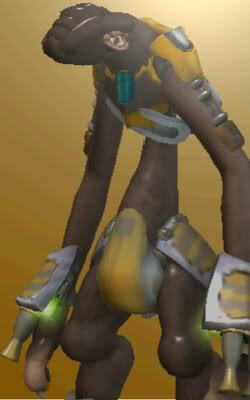 I've got another character planned out, and made in Spore, I'm just thinking about adding him to the story later. Is that okay, or do all characters need to start from the beginning? Feel free to introduce your character in whatever manner you like, just so long as it makes sense. Awesome. Perhaps after this escapade with the bazaar. May I join this as well please? I have this character I want to use but it's male. 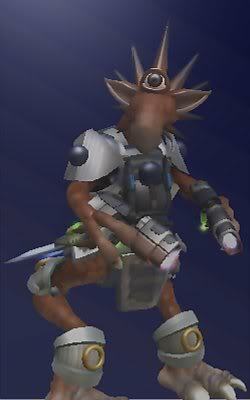 I'll show you a pic of him through spore. 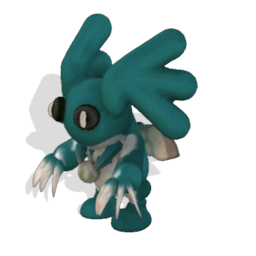 This is Chalen and his race are known as the Space Sprites (do not ask why I chose that name). He has grammer speaking trouble but he is very kind, clever and a great friend to all. Have I got to dress him up in armour? I don't mind either way. It doesn't matter how your character looks, all you need to do is fill in the character sheet on the OP and I'll add you. You might have missed it Shadow, but the drones were introduced in bold text -- that means you have to fight them like you would another player, except that it's me controlling them. Your post mentions impaling one, so that's a problem, to start with. My suggestion is that you replace that paragraph of yours with a post declaring that you attack the probe, and state how you do so, along with any other detail you want. I saw your edit, it's good -- I'll get to work on a response. New character! I'll introduce him at the earliest possible time. Bio: Grecsh comes from the O’onthos racial branch Zin, characterized by their love of destruction. Not much is known about his past, and he doesn’t like to talk about it much. Lack of money is what drove him to join the Rangers, which he found out about through Xol Til’ack, a friend and fellow merc. Equipment: Low powered semiautomatic machine guns that would be mounted on his arms and hidden under armor until needed, retractable medium powered arm-cannon, retractable visor and mouth piece. Bio: During a fierce battle with a Decepticon, Crank received severe damage to his internal circuits disabling his ability to scan and transform into anything that required some sort of energy. Crank fled Cybertron to find some means of repair. Until he finds it, Crank can only transform into a steel crate. Strengths: Skilled in combat, fast, very intelligent and specializes in stealth. Very courageous. Weaknesses: Low armor, vulnerable during transformation, slightly vulnerable to electricity-based attacks, weapons don't deal a great amount of damage. Adding your new character, Drago. Puk, I'll keep an eye out for your edit. Bio: Gor'La Cerb was born to a wealthy Lynski family fifty-one years ago. After trying and failing to forge a life for himself on Lynskinar-I, he lost faith in the government and formed the Marin-Si'hu, a resistance movement dedicated to toppling the current regime and establishing a military dictatorship in its place. After a violent conflict that lasted almost a year, the Marin-Si'hu was defeated at the Battle of Aeris. Gor'La was believed dead by the Lynski High Command, but in truth he had actually cloned himself, then killed the clone and escaped his headquarters before it was captured. He made it out of the system by sneaking off on a cargo ship, and then blew it up to destroy evidence. After the massacre at Aeris, Gor'La became a mercenary. One of his missions took him to Sector B-12, where he encountered the Rangers and eventually joined them. While he enjoys working with the Rangers, his true goal is to obtain the resources necessary to create a new Marin-Si'Hu and pick up where he left off. Strengths: Gor'La is clever even for a Lynski, and relies on his intellect more than his weapons. His energy dampener can dissipate energy beams (such as a Pulse Blast) fired at him. He is very well versed with technology, particularly firearms. Weaknesses: The energy dampener is only effective at long range, and only works on energy weapons -- it can't deflect projectiles, shrapnel, or flames. Furthermore, his short stature and weak arms make him pretty much useless at hand-to-hand combat (though he does carry a dagger with him at all times, just in case).